A variety of new arrivals made for a reasonably interesting day's census, the highlights of which were 2 Great Grey Shrikes. 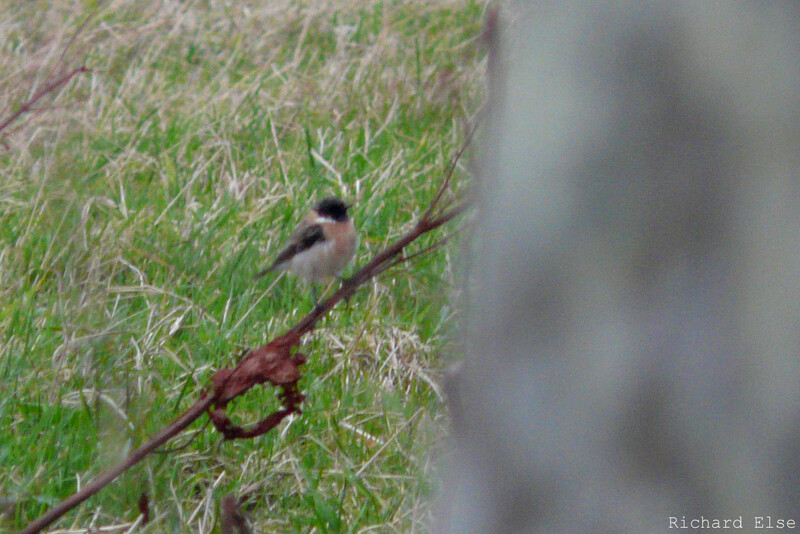 Also of interest were a rather late Swallow and an equally late Common Redstart. Counts of the more every-day species, many of which would be lingering birds from earlier in the week, came to 18 Robins, 7 Black Redstarts, the same Whinchat, 3 Wheatears, 5 Goldcrests, 1 Blackcap, 8 Chiffchaffs, 2 Bramblings, 3 Greenfinches, 3 Goldfinches and a Lesser Redpoll. The Mistle Thrush and 2 Yellowhammers were still around, as was the Short-toed Lark, which is starting to look a little weather-beaten. Thrushes were still present in reasonable numbers, with 515 Fieldfares, 173 Blackbirds, 157 Redwings and 19 Song Thrushes logged. 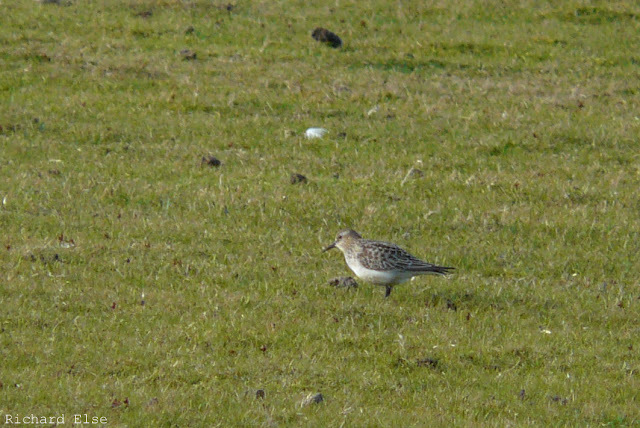 The Baird's Sandpiper remained on the links, while a noticeable increase in Purple Sandpipers brought the day's count to 109. 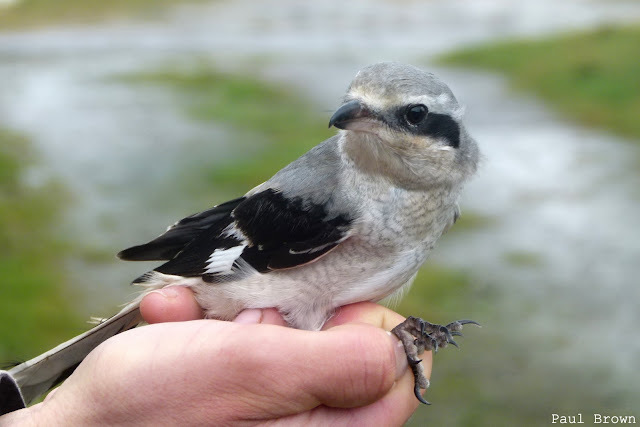 One of the Great Grey Shrikes was discovered as it devoured one of the local mice in one of the observatory's Heligoland traps. Small numbers of migrants continued to arrive, including a late Garden Warbler, a Mistle Thrush and a third Yellowhammer joining the previous day's 2. Numbers of other passerine species included 18 Robins, 4 Black Redstarts, 6 Blackcaps, 4 Chiffchaffs, 5 Goldcrests, 2 Goldfinches and a Greenfinch; 2 Hen Harriers, a Sparrowhawk, a Merlin and 4 Woodcocks were the best of the non-passerines. And the Short-toed Lark was still there as usual. A New North Ronaldsay Year-list Record! 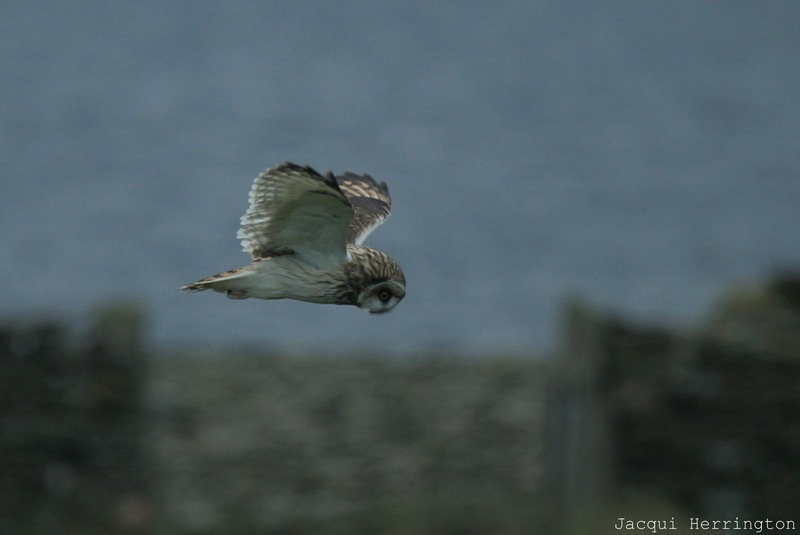 Since early in the spring, an aim of ours has been to record more species on the island in 2011 than have been seen in any other year. The previous best year-list was an impressive 215 species seen in 2003, but we thought that, with a bit of extra observer coverage, this was a reachable target. Now, after carefully double-checking the list, we can proudly announce that 2011 has officially been the best ever birding year on North Ron. The Firecrest earlier in the week was species number 216 for the year, while Dusky Warbler and Baird's Sandpiper have since taken the list to a record-smashing 218! 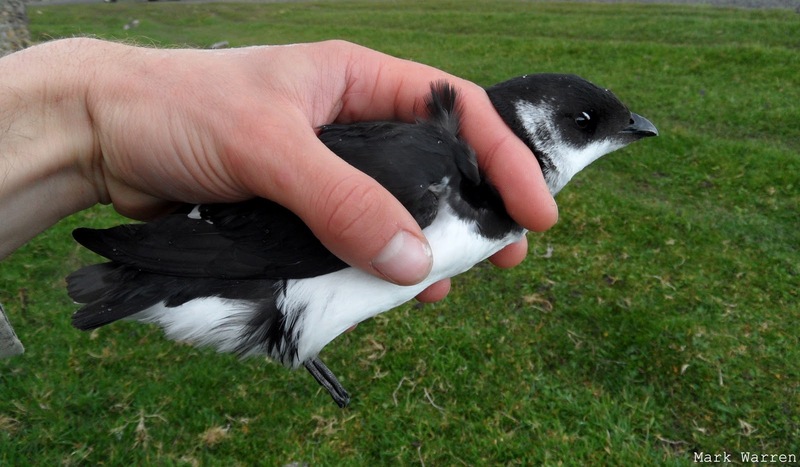 With two months still to go, and quality birds still arriving, just how high can we set the year-listing bar? And we've still not had a Buzzard. The surprising highlight of the day was a juvenile Baird's Sandpiper with the Dunlins and Ringed Plovers on the golf course. 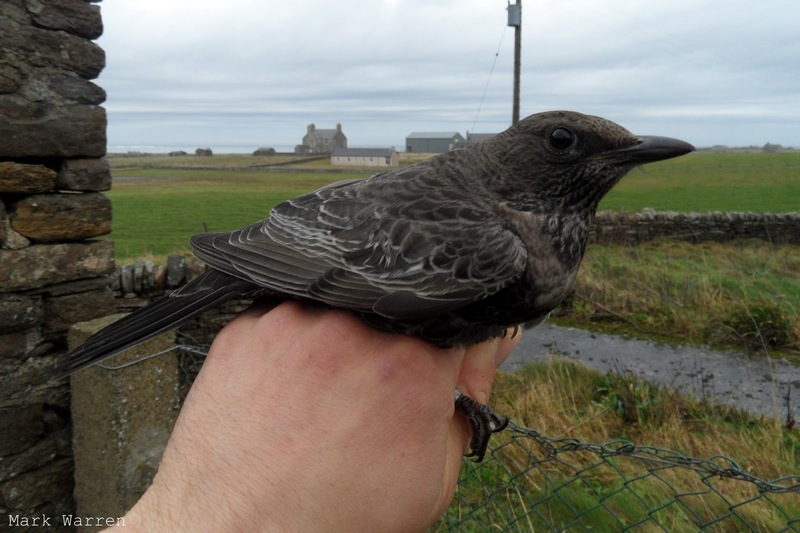 This record, slightly later in the year than might be expected, is only the second for Orkney; the only previous bird was also on North Ronaldsay in early October 1993. 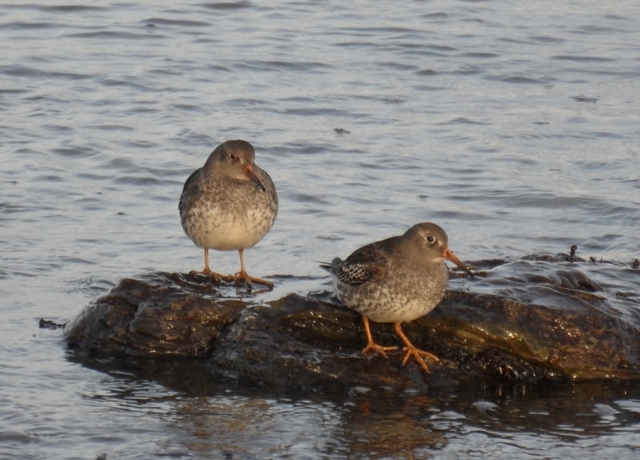 Besides the sandpiper, there was relatively little change in the number of birds present. The Dusky Warbler was still present, while counts of other small migrants came to 17 Robins, 4 Black Redstarts, 3 Wheatears, 777 Fieldfares, 254 Redwings, 159 Blackbirds, 26 Song Thrushes, 7 Blackcaps, 2 Chiffchaffs, 4 Goldcrests and a Yellowhammer. A variety of finches included 29 Bramblings, 2 Greenfinches, a Goldfinch and 3 Common Redpolls. A Long-eared Owl and 4 Woodcocks were the pick of the non-passerines. 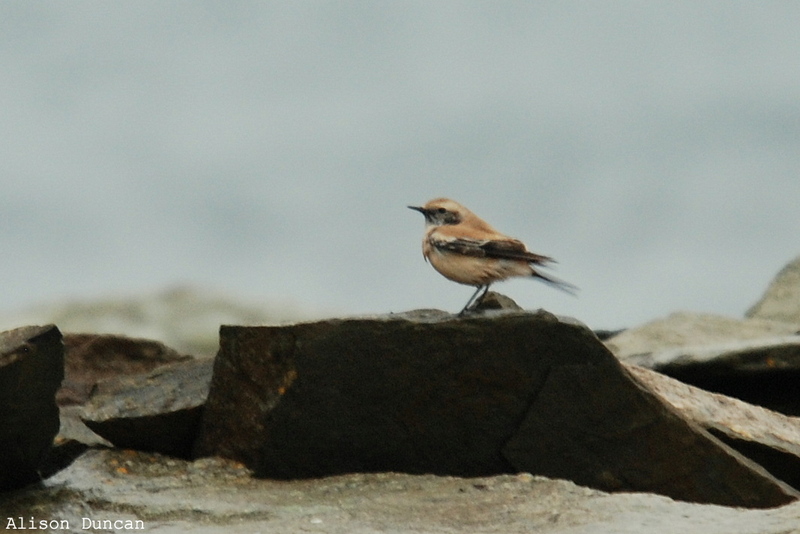 Numbers of most migrants continued to fall slightly, and fewer new birds seemed to have arrived than in previous days. The Dusky Warbler remained in its favoured strip of wilted irises near Burray, showing quite well at times. The ever-present Short-toed Lark also remained, along with a Goldfinch, a Whinchat, 5 Black Redstarts, 2 Wheatears and 2 Woodpigeons. Counts of other migrants came to 2 Yellowhammers, 16 Robins, 4 Blackcaps, 7 Chiffchaffs and 10 Goldcrests. Thrush numbers had dropped to 448 Fieldfares, 145 Blackbirds, 100 Redwings and 18 Song Thrushes. Although quite confiding, the Dusky Warbler was often difficult to see as it scurried around Locustella-like at the bottom of the irises near 'P.G.Tips Field', a patch of dense canary grass which is just to the west of 'Great Snipe Land'. After watching flocks of thrushes departing south out to sea the previous evening, it was surprising to find plenty of birds still present in the morning, although numbers of some species were noticeably diminished. 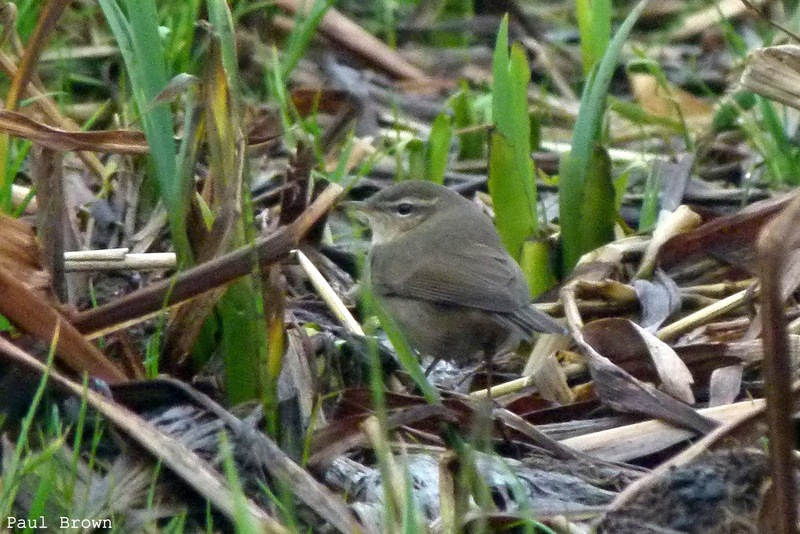 There were also some fresh migrants to be found, the highlight of which was North Ronaldsay's second Dusky Warbler. Almost as rare, in an island context at least, was a Firecrest near Sangar - this is only the fourth record of the species here. Thrushes were still very conspicuous, with 1052 Fieldfares, 308 Redwings, 182 Blackbirds and 51 Song Thrushes logged. Of the other migrants, a count of 12 Black Redstarts was particularly noteworthy as it is the most ever recorded on the island at once. An influx of Skylarks brought the day's count to 153 birds, while other small migrants included 23 Robins, a Whinchat, 8 Blackcaps, 9 Chiffchaffs, 13 Goldcrests, 17 Jackdaws, a Greenfinch, a Goldfinch, a Common Redpoll and a Lesser Redpoll. 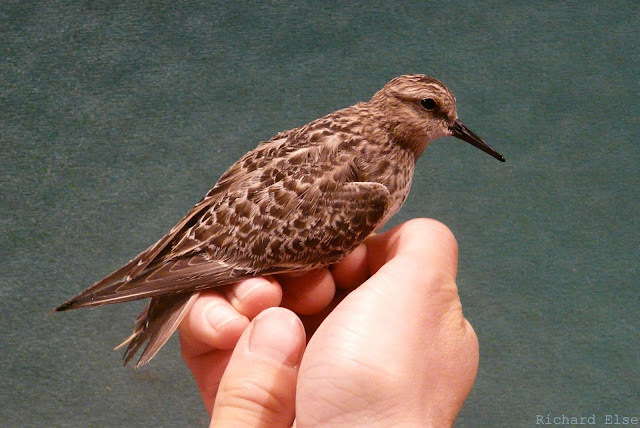 Woodcocks have arrived in numbers in the last few days, including this individual ringed at Holland House. After strong south-easterly wind and steady rain overnight, it was not surprising to find the whole island, particularly the leeward coasts, alive with thrushes and other migrants in the morning. 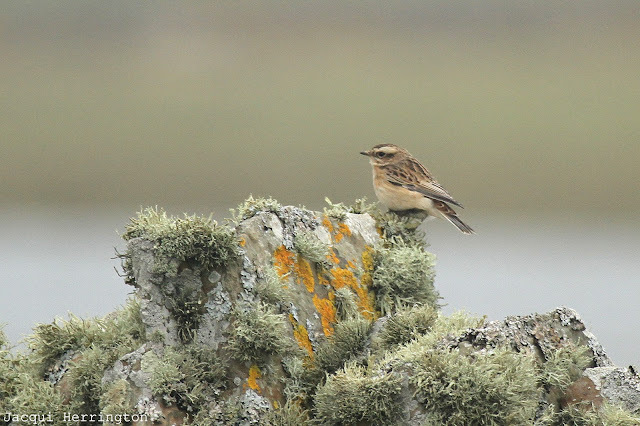 There was nothing particularly rare apart from the previous day's Siberian Stonechat and the long-term resident Short-toed Lark, but the numbers of common species were quite impressive. Counts of thrushes amounted to 1530 Fieldfares, 1093 Blackbirds (the observatory's highest ever count of this species), 470 Redwings, 109 Song Thrushes, 1 Mistle Thrush and, at long last, the first Ring Ouzel of the autumn. A good variety of less numerous passerines included 6 Black Redstarts, 27 Robins, 5 Wheatears, 107 Skylarks, 19 Blackcaps, 6 Chiffchaffs, 10 Goldcrests, 16 Jackdaws, 18 Bramblings, 2 Chaffinches, 2 Greenfinches, 1 Goldfinch, 1 Common Redpoll and 2 Yellowhammers. Non-passerines were no less diverse and included 31 Woodcocks, 4 Woodpigeons, 2 Long-eared Owls, 2 Short-eared Owls, 4 Sparrowhawks and 7 Grey Herons. A juvenile Long-tailed Skua was lingering off the north of the island, while a juvenile Pomarine Skua was seen harassing Great Black-backed Gulls near Twingness. 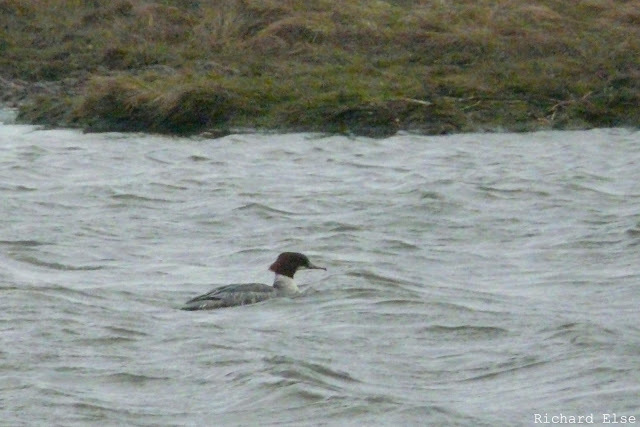 The first 2 Goldeneyes since early spring flew past at sea, 24 Barnacle Geese were roosting with the gulls on Tor Ness and a migrant Moorhen looked out of place amongst a flock of Blackbirds on the west coast. Despite the weather verging on unbirdably windy, the same south-easterly winds delivered plenty of new migrants to the island. The bird of the day, a male Siberian Stonechat near Hooking Loch, spent the day sheltering from the gales along a low wall and hiding in the adjacent long grass. This is about the 8th record for North Ronaldsay, and the first since 2001. Siberian Stonechat: Yes, that blurry black and orange thing in front of the nearly-in-focus bit of grass and to the left of the highly obtrusive foreground fencepost. A Goshawk at Holland House was equally rare from a North Ronaldsay perspective, there being 7 previous records of this species too, although it was the third record of the year. Thrushes made up the bulk of the migrant numbers, with log counts totalling 670 Fieldfares, 195 Blackbirds, 179 Redwings and 22 Song Thrushes. The best of the other passerines were a Greenfinch, a Goldfinch, 2 Common Redpolls, 5 Bramblings, a Blackcap, 6 Wheatears and 3 Robins. Other oddments included a Woodpigeon, a Short-eared Owl, 5 Woodcocks, a Hen Harrier, 2 Sparrowhawks and a Merlin. A few more thrushes came in on gale-force south-easterly winds, with 129 Fieldfares, 85 Blackbirds and 56 Redwings logged. Despite the previous evening's promising signs, other passerines of interest were very thin on the ground and amounted to little more than a Whinchat, 5 Bramblings and 2 Jackdaws. A Short-eared Owl, a Merlin and a Sparrowhawk were seen on the land, and a Pomarine Skua was off the north end of the island. 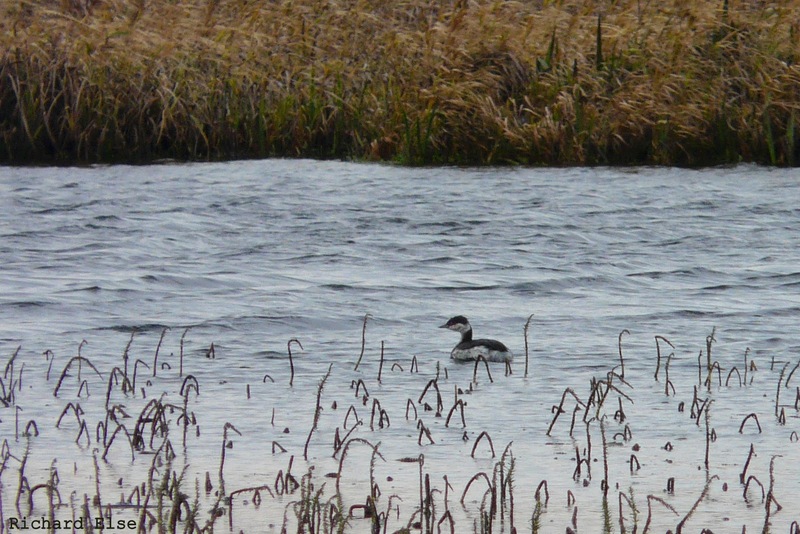 A Slavonian Grebe on Hooking Loch and a Grey Phalarope seen flying over Holland House were the highlights of a quiet morning, but the wind backing slightly to the east in the afternoon produced an almost immediate arrival of small numbers of passerines. A Yellow-browed Warbler with a ring on its leg was interesting, it being more than 2 weeks since the previous sighting of the species here, while 13 Blackcaps, 2 Chiffchaffs, 2 Bramblings and a Goldfinch also appeared after midday. Thrush counts came to 112 Fieldfares, 44 Redwings, 2 Song Thrushes, 50 Blackbirds and the autumn's first Mistle Thrush. The Short-toed Lark and the Jackdaw both remained, an Arctic Tern was in Nouster Bay and a Short-eared Owl was near the lighthouse. Today's Slavonian Grebe is the third record this year, after one in mid February and a bird still partly in breeding plumage in September. The day's highlight was a juvenile Long-tailed Skua seen flying around near Garso, while at least 3 Pomarine Skuas, 3 Great Skuas and a Little Auk passed by the seawatching hide. The Short-toed Lark, now resident in the same spot for over a month, was still by Bewan Loch. Otherwise, it was a very quiet day, with just 79 Fieldfares remaining from the previous day's influx and almost no new migrants. An arrival of 566 Fieldfares and 70 Redwings in the fields around Twingness accounted for nearly all the day's passerine migrants, with little besides a lone Jackdaw to be seen in the rest of the island. 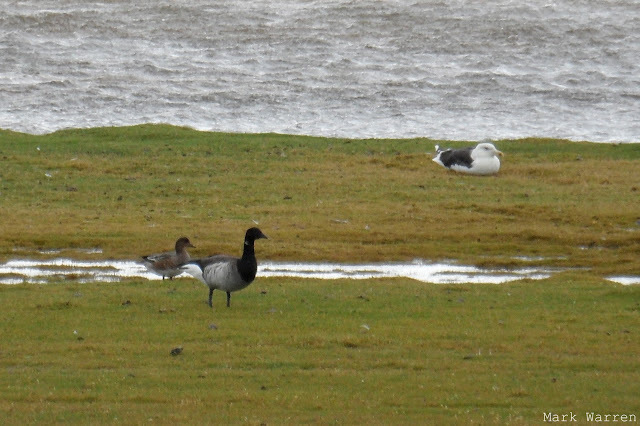 The autumn's first Pale-bellied Brent Goose and Iceland Gull were the best of the non-passerines, and a couple of Woodcocks were also seen. In much calmer and more pleasant conditions, a short morning seawatch finally produced the first Long-tailed Skua of the year, as well as a juvenile Glaucous Gull, an Arctic Skua, 5 Great Skuas, 2 Sooty Shearwaters and 248 Kittiwakes. 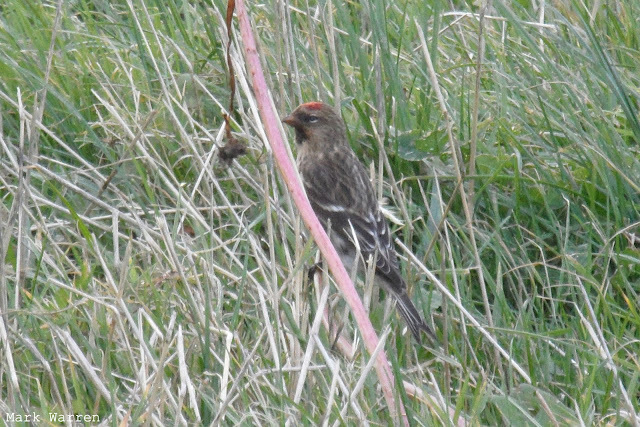 Landbird interest was mostly limited to finches, with 2 Goldfinches at Senness, a large arrival of Twite taking the day-count to 119, the Greenland Redpoll still at Holland House and a Common Redpoll of a different variety at Garso. 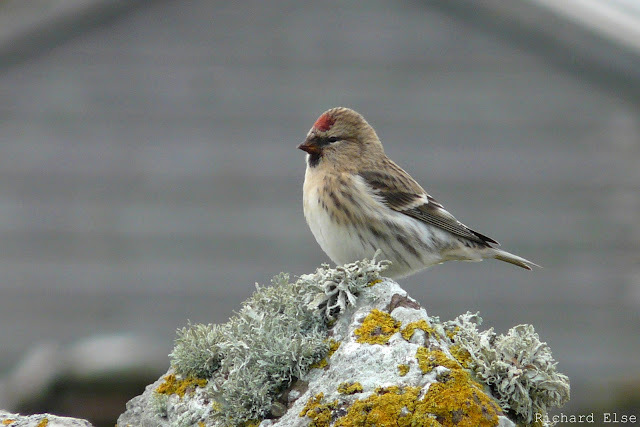 The Garso Redpoll was quite distinctive in appearance with a large, though faintly streaked, white rump, and could be of Icelandic origin. Just about the only migrant worth mentioning from a cold and very windy day was a Greenland Common Redpoll at Holland House. This is the first record of a rostrata bird on the island this year. The best new birds were a couple of confiding Grey Phalaropes feeding in the surf near Howar. There was little else to report apart from the long-staying Short-toed Lark still at Bewan. The highlights, if they can be described as such, of another very quiet day of strong westerly wind and showers were a Jackdaw, a Carrion Crow and a Kestrel. 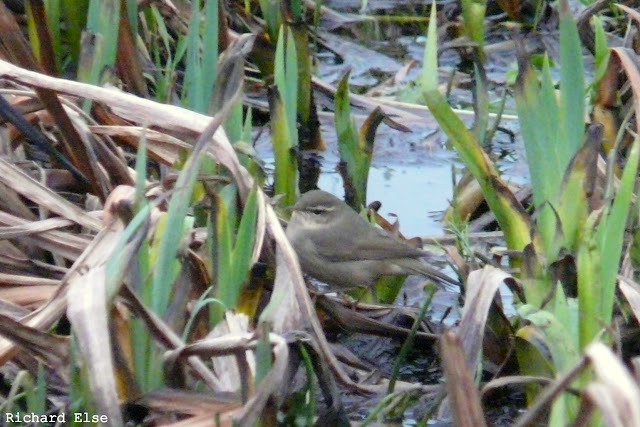 Other passerines on the island, most of which arrived a few days or more previously, included a Robin, a Whinchat, 14 Fieldfares, 19 Redwings, a Pied Wagtail, 3 Blackcaps, a Chiffchaff, a Goldcrest, 2 Chaffinches and 10 Bramblings. 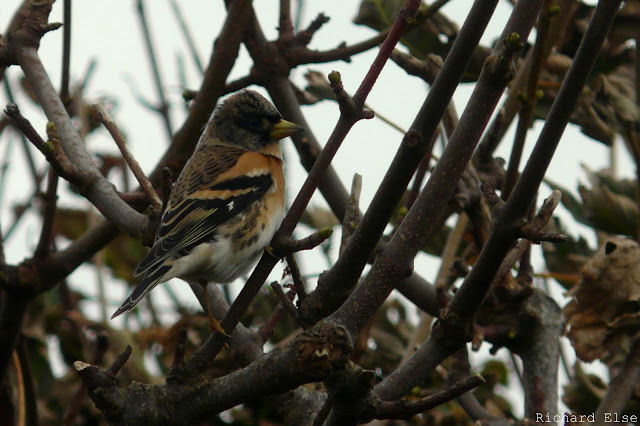 A small flock of Bramblings has been frequenting the Holland House gardens and nearby stubble fields for a few days. 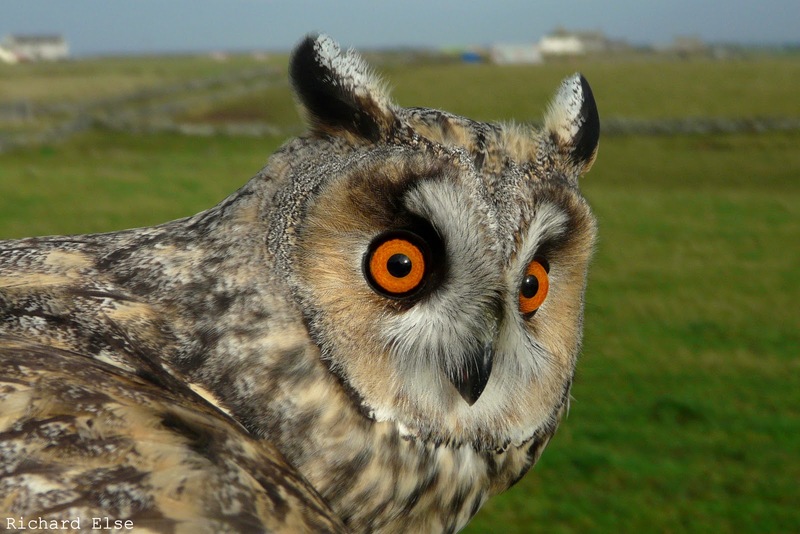 Although there were few new birds to report, it was quite a good day for birds of prey, with 2 Sparrowhawks, 2 Merlins, a Peregrine, a Hen Harrier, 2 Short-eared Owls and a Long-eared Owl seen. A Grey Phalarope was off the north of the island, the first Mute Swan of the autumn appeared on Ancum Loch and a Little Auk was found swimming on Bewan Loch. The resident Short-toed Lark made another appearance in its usual spot, and the previous day's Common Rosefinch was still around. A little bit of passerine immigration was evident, although, besides 16 Blackcaps dotted around the island, the only notable species was a new juvenile Common Rosefinch at Holland House. 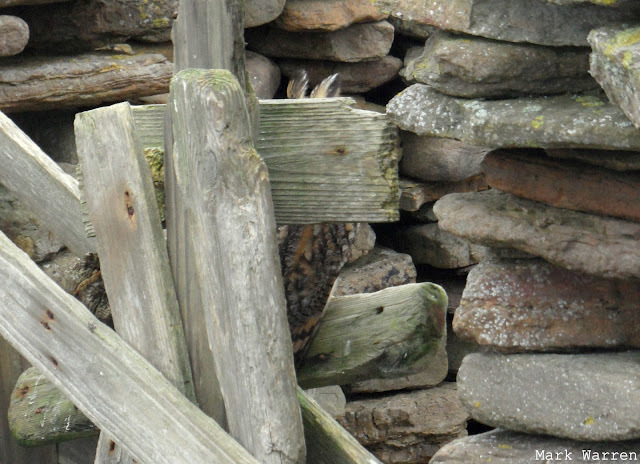 A Long-eared Owl and a Short-eared Owl were present and 3 Woodcocks were found. The Great Grey Shrike was seen briefly in the morning, while the Olive-backed Pipit continued to show well at Westness all day. 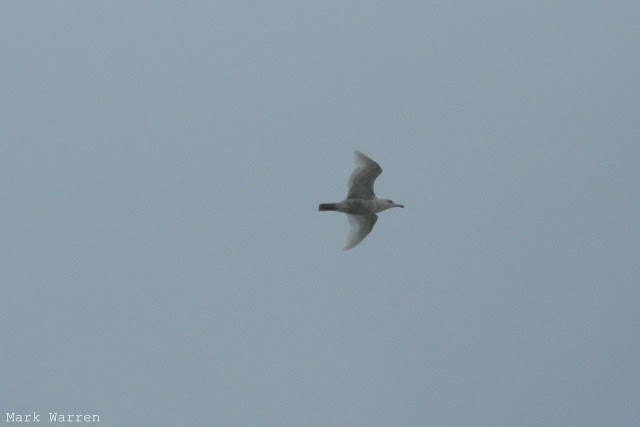 Seen flying south down the west coast early in the morning, the second Goshawk of the year was the best bird of the day. 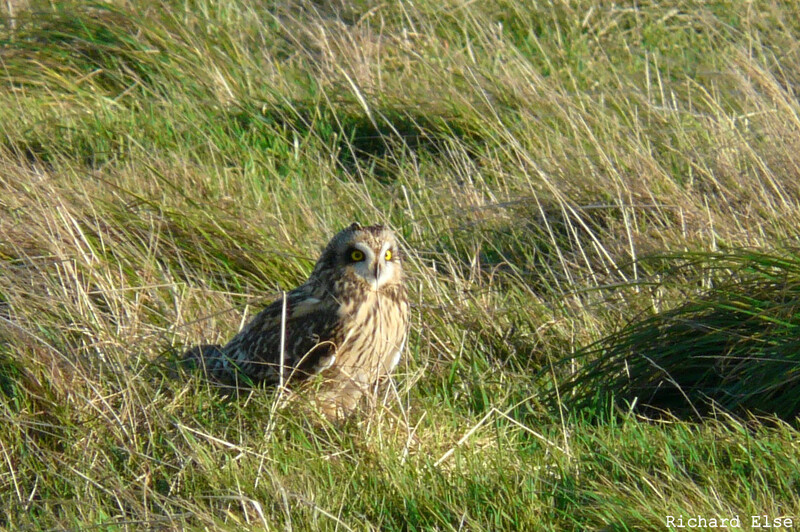 At least 3 Sparrowhawks were also seen, along with 2 Merlins, 4 Short-eared Owls and a Long-eared Owl. A couple of Woodpigeons were also new, and 3 Woodcocks were the only notable waders. Slightly more passerine migrants were present, including 18 Goldcrests, 1 Lesser Whitethroat, 5 Blackcaps, 4 Chiffchaffs, 4 Robins, 1 Dunnock and 63 Fieldfares. The number of Bramblings reached 15, and other finches included 3 Redpolls, 2 Siskins and a Chaffinch. Both the Olive-backed Pipit and the Great Grey Shrike were still around. 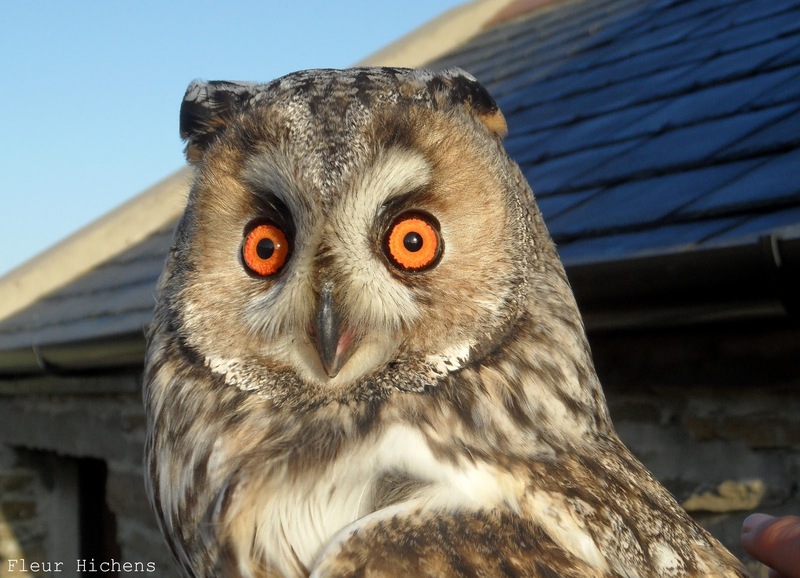 The Long-eared Owl was the highlight of a short mist-netting session at Holland House. After a fairly quiet morning a few birds seemed to begin arriving at around midday, one of which was a smart Olive-backed Pipit at Westness. 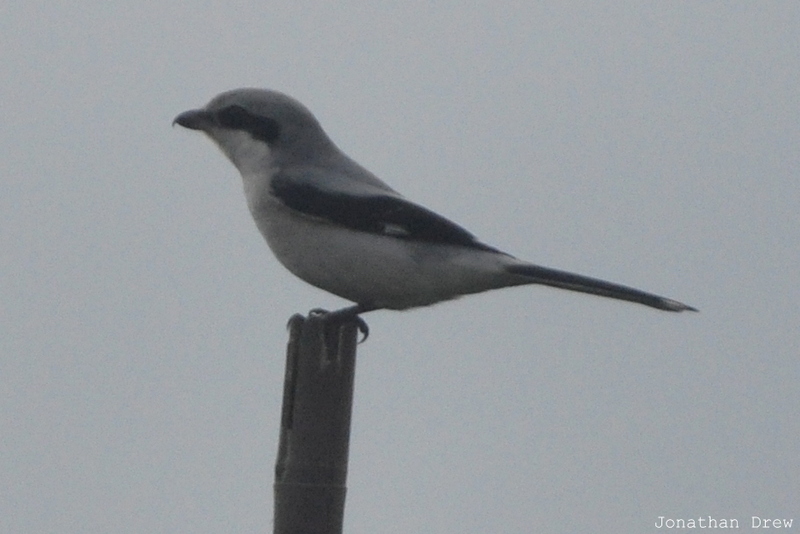 Later in the afternoon the island year-list gained another species in the shape of a Great Grey Shrike near the airfield. A few common migrants that appeared during the day included 8 Goldcrests and 8 Bramblings, while more unusual sightings included a Short-eared Owl, a Woodcock and 3 Pomarine Skuas, 2 of which flew low down along the links. 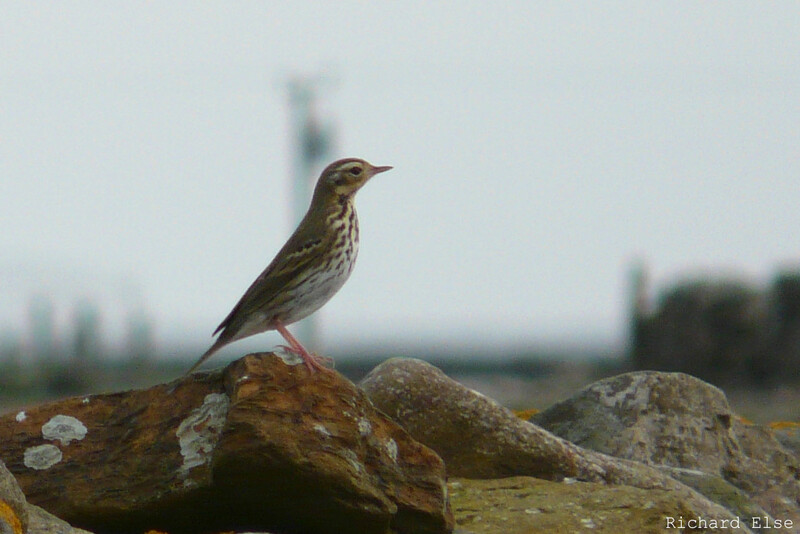 Today's Olive-backed Pipit is the 16th to be recorded on North Ronaldsay. In terms of landbirds, this was just about the quietest day of the autumn, with nothing more than a Greenfinch worth mentioning. Thankfully, seabird passage provided a bit more to write about. 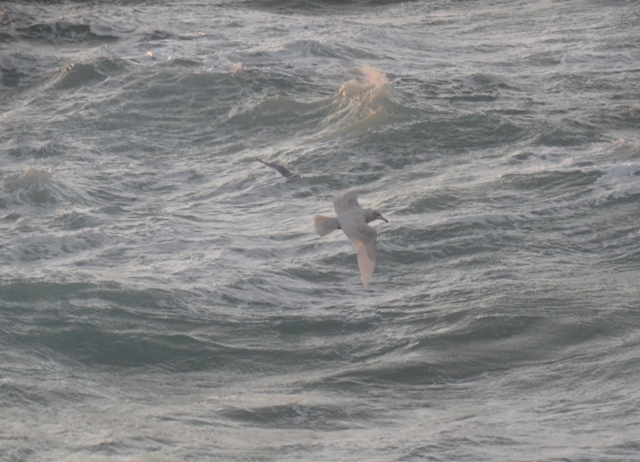 The star bird, making its appearance early in the afternoon, was our second Fea's Petrel of the year. 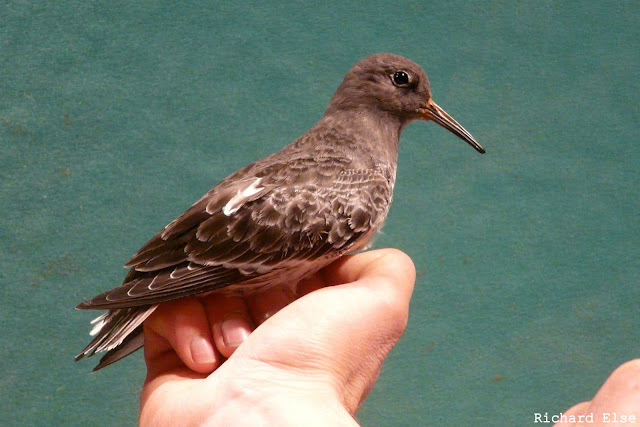 This is the fourth record of the species for North Ronaldsay, and the third in just under a year. 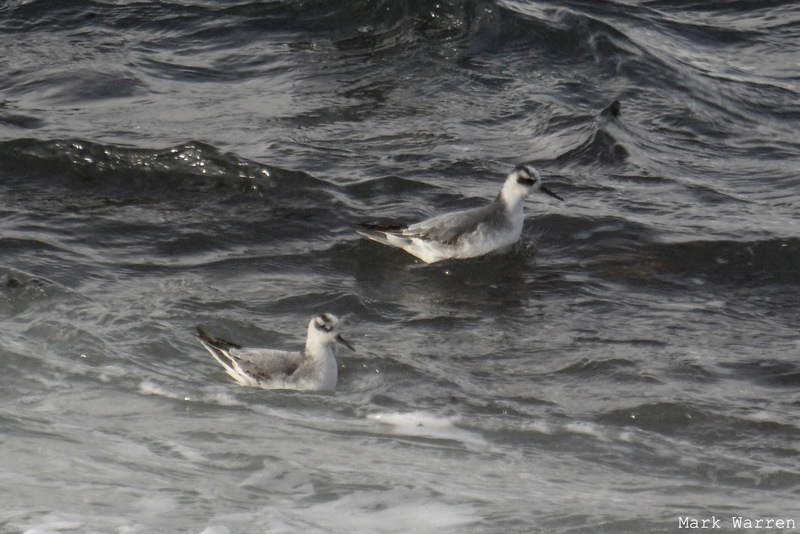 Other notable seabirds seen during 6 and a half hours in the hide included 2 Pomarine Skuas, a Grey Phalarope, a Little Auk and 2 Common Scoters. A day total of 1415 Gannets was only just shy of the highest ever count here, while other counts came to 269 Fulmars, 23 Sooty Shearwaters, 1 Manx Shearwater, 1 Storm Petrel and 812 Kittiwakes. 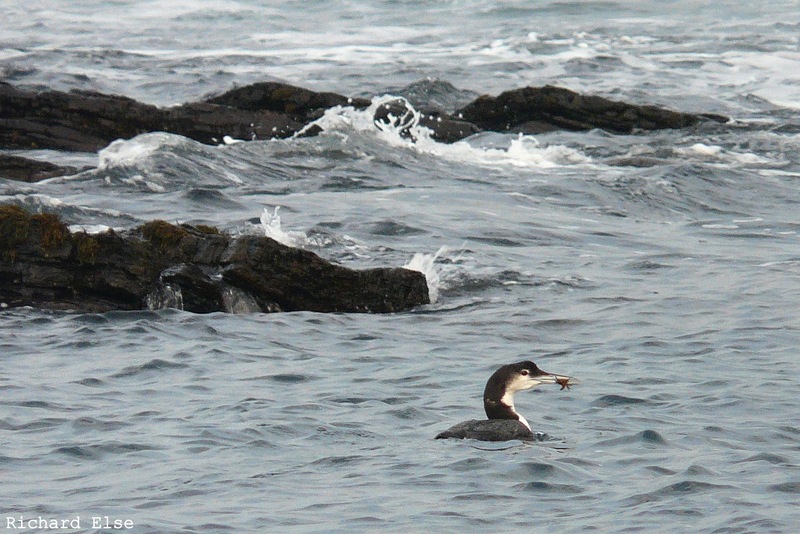 Although the seawatching was quite slow, there was slightly more happening than there was on the land. 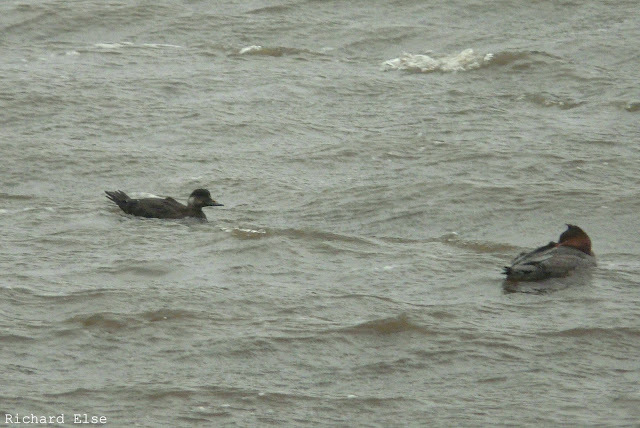 Numbers of the common species were low, but 5 Grey Phalaropes and a Little Auk were recorded passing by Dennis Head and 21 Red-breasted Mergansers were dotted around the coast. 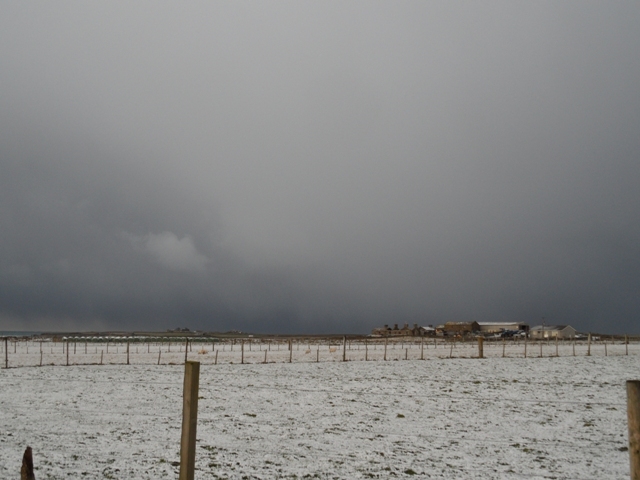 The only landbirds worth mentioning were 196 lingering Redwings and 16 Fieldfares. In more windy westerly weather, the most interesting sightings all involved wildfowl. Pick of the bunch was a drake Velvet Scoter, a very scarce species here, that flew past the old beacon heading east during the morning. Greylag Geese were scattered around the island, with 12 Barnacle Geese, 5 Pink-footed Geese and a European White-fronted Goose arriving during the day and the lingering Greenland White-fronted Goose still in residence at the north of the island. 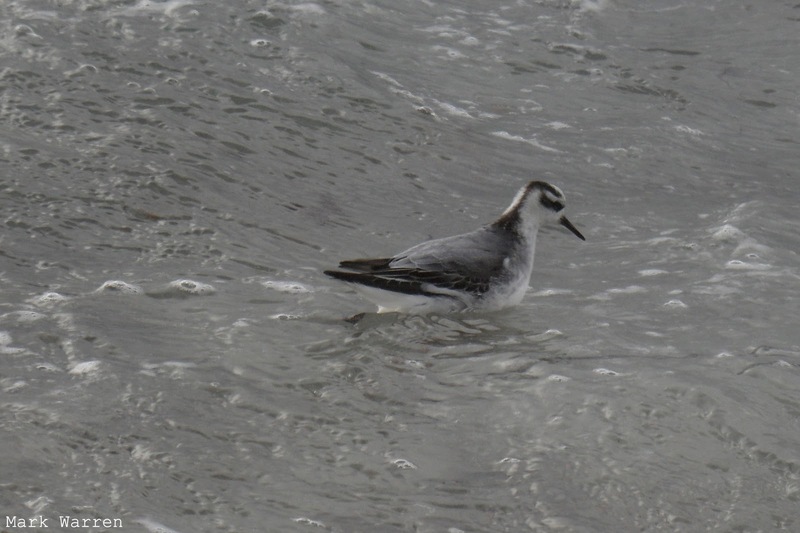 A Grey Phalarope was at Quoy Banks in the morning, and a presumed different individual was at Bridesness a short time later. The long-staying Short-toed Lark, reappearing after 6 days, was the best passerine. A Common Redpoll was seen and counts of thrushes came to 29 Fieldfares and 355 Redwings. 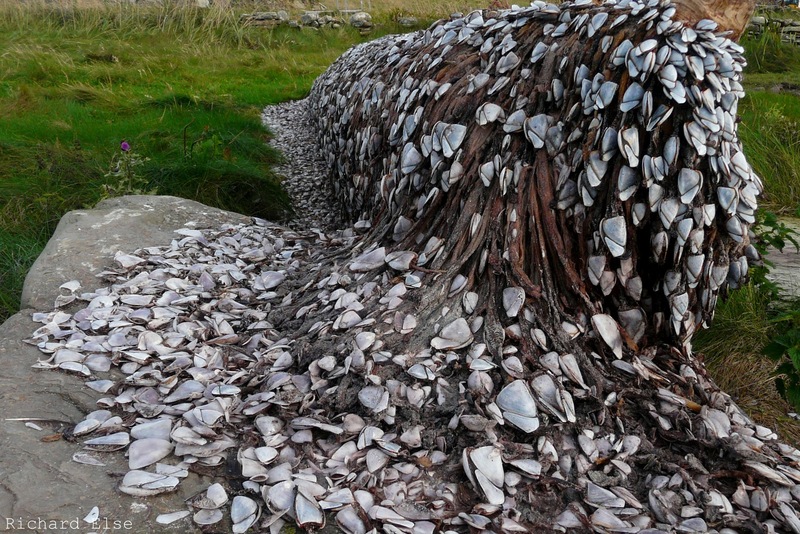 As nobody has taken any usable bird photos in the last few days, I finally get chance to use this picture of an impressive cluster of Goose Barnacles taken back in September. In the autumn, these creatures finish their amazing transformation into Barnacle Geese, lose their protective shells, detach themselves from their driftwood anchor and take flight, ready to spend the winter grazing with other types of geese. 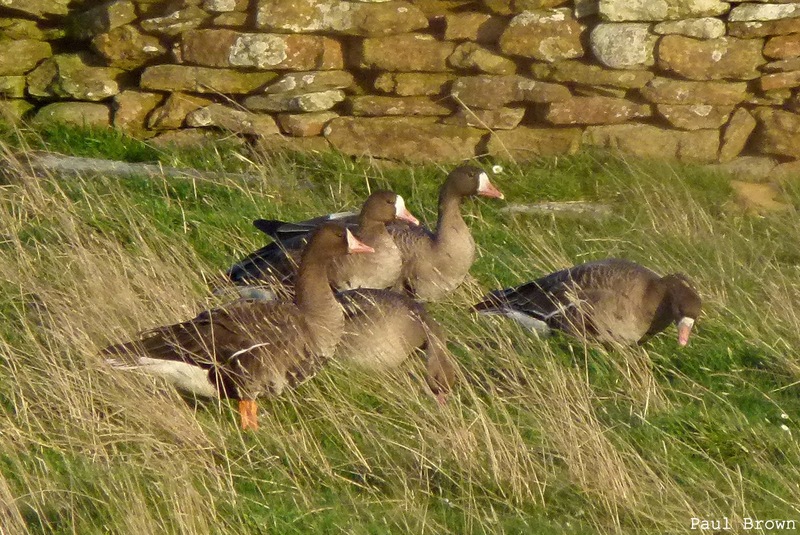 The Barnacle Geese seen on the island today must be among the first to have completed their metamorphosis this year, but, by the looks of this picture, we can expect many more in the coming weeks. Reference: Cambrensis, Giraldus. Of barnacles, which grow from fir timber, and their nature (1188). A big arrival of thrushes involved 95 Fieldfares, 12 Song Thrushes and more than 2000 Redwings, most of which were concentrated around the south-western part of the island. The crop field at Kirbest held 100 Skylarks and among them, the bird of the day, a Woodlark. There were few other passerine migrants, although 8 Bramblings and a Siskin were seen and the Snow Bunting count reached 332 birds. A Grey Phalarope at Westness was an addition to the year-list, and either it or a second bird was seen lingering off the west coast later in the afternoon. 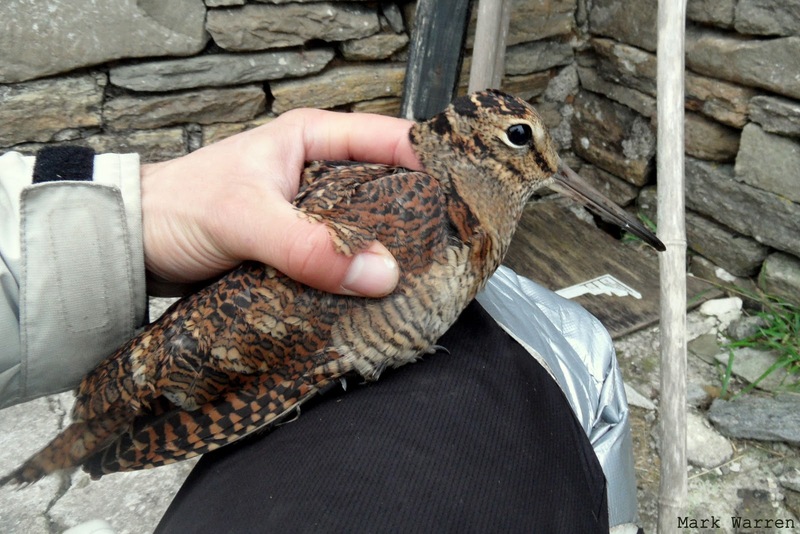 The first Woodcock of the autumn was near Twingness, while 17 Jack Snipe was a clear increase on previous days. Sea passage was much slower than the day before, with just 1 Little Auk and only a small number of Fulmars and Shearwaters passing by, and the only notable wildfowl movement was 21 Whooper Swans and 122 Pink-footed Geese. The wind finally dropped; the rain abated; the mist nets were opened with high hopes of trapping all the Catharus thrushes that had spent the week sheltering unseen under the fuchsia bushes; but the most interesting passerine of the day, winning by a clear head, was a single Dunnock. Sea passage was a bit more interesting. 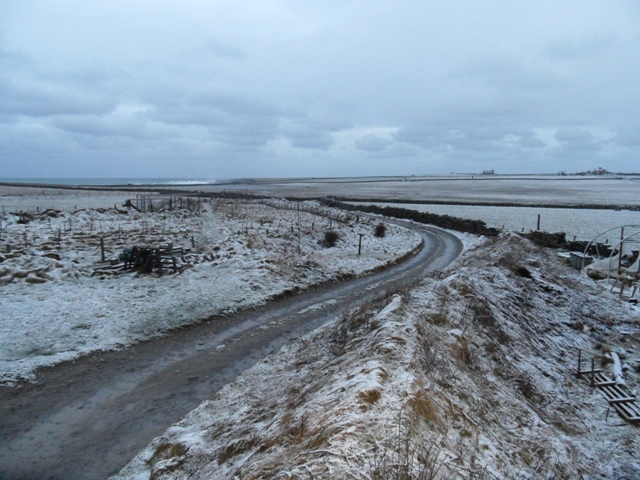 The species composition had a distinctly late-autumn feel, with 25 Little Auks, a juvenile Glaucous Gull and 3 Long-tailed Ducks indicating that winter is not that far away, and a total count of 2759 Fulmars including 28 northern 'blue' birds among them. Other counts from 5 and a half hours in the hide included 135 Sooty Shearwaters, 17 Manx Shearwaters, 583 Gannets, a Common Scoter, 9 Great Skuas, 194 Kittiwakes and 350 or so mixed Razorbills and Guillemots. 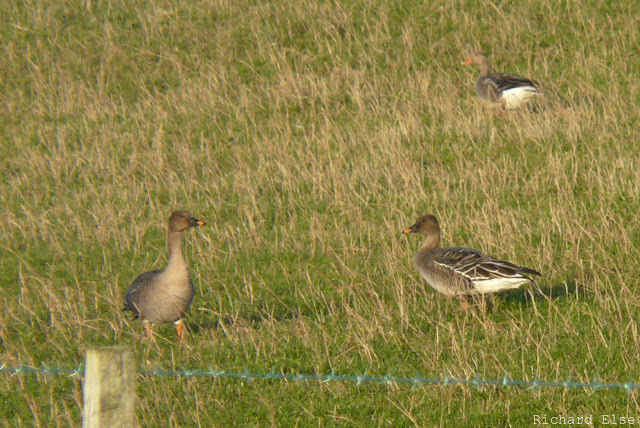 It was another quiet day, although 4 White-fronted Geese and a Pomarine Skua flying past were noteworthy sightings. 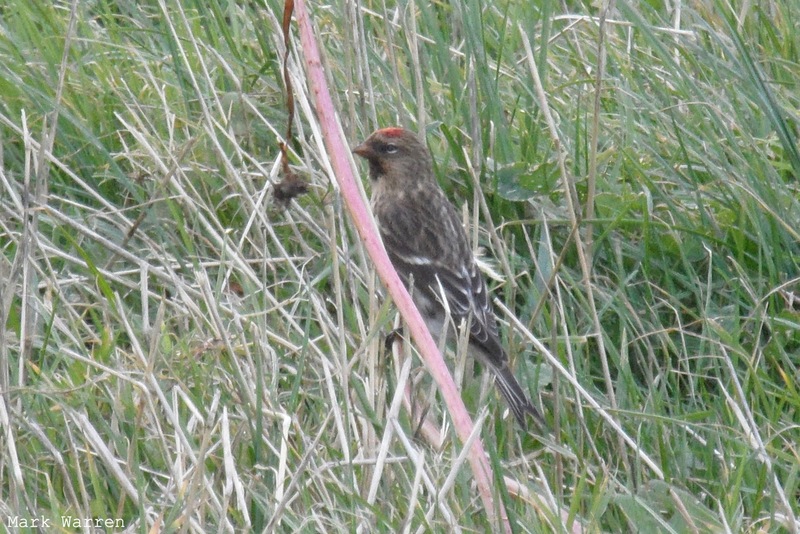 A Common Redpoll was probably new, while other passerines included a Barred Warbler, a Common Rosefinch, a Whinchat and a Robin. 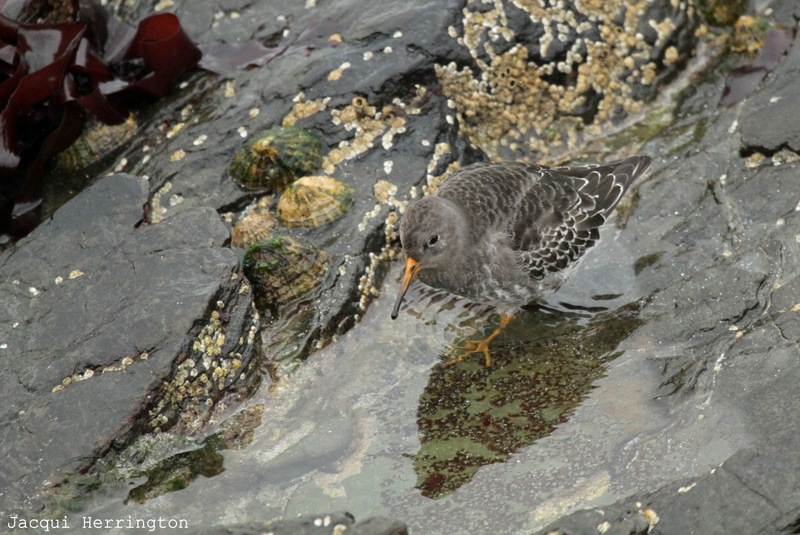 Plenty of the common waders have been around recently, including Purple Sandpipers in several rocky areas of coastline. The Whinchat has been resident around the observatory traps for most of the week, somehow evading capture so far. In a monkey's wedding day of sunshine, heavy showers, wind, rainbows and hailstorms admixed, avian diversity couldn't quite match that of the weather. 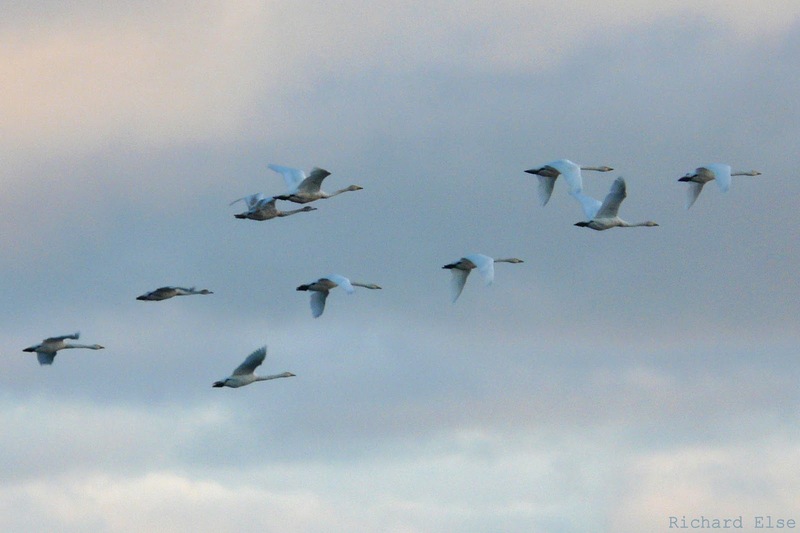 There were hardly any geese on the move, but at least 16 Whooper Swans were on the island. A Barred Warbler near Ancum Loch could well have been the bird from the previous week. 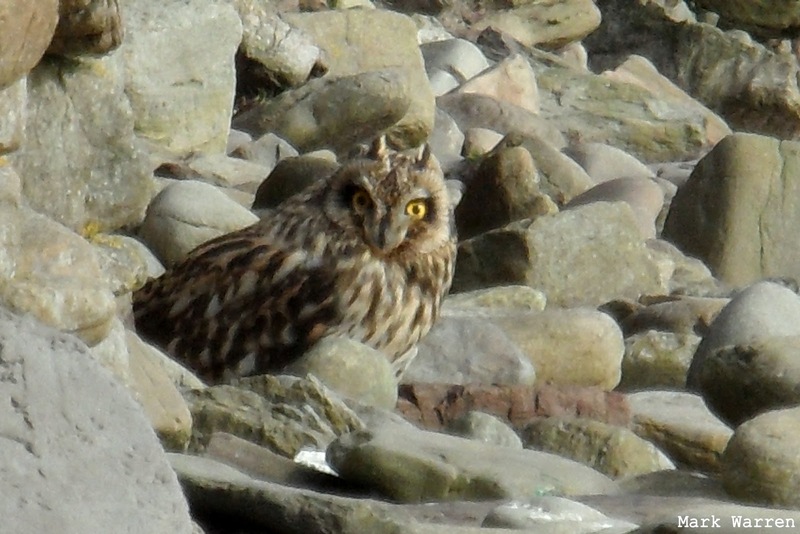 A Short-eared Owl at the north of the island might also have been the bird from earlier in the week, and 3 Grey Plovers were probably all long-stayers. There did seem to have been a considerable increase in the number of Snow Buntings, with about 200 dotted around the island. 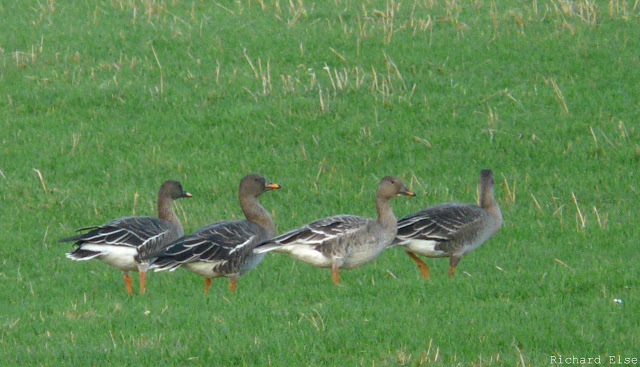 By far the year's biggest movement of geese began early in the morning and continued throughout the day, skein after skein passing south overhead. Of over 3000 birds counted, around half of them were Pink-footed Geese; the other half were Greylags. 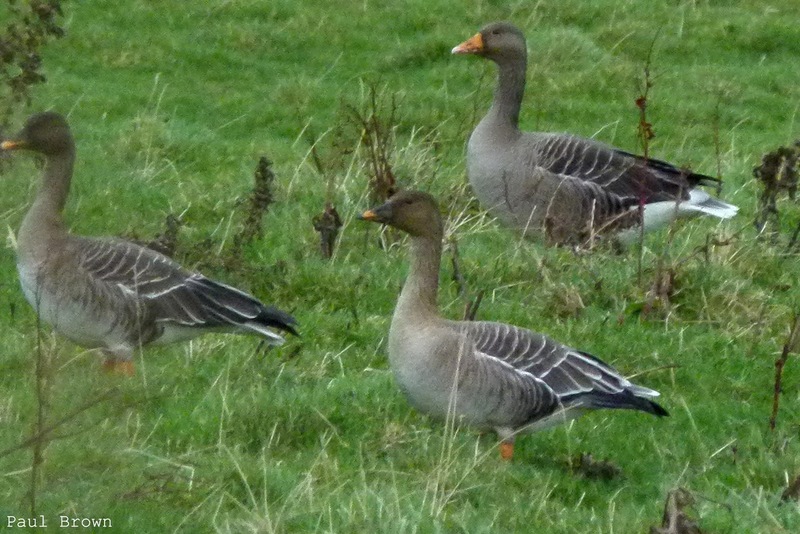 Other passage wildfowl included the first 2 Goosanders of the year and 3 Whooper Swans, while the Greenland White-fronted Goose was still at Bewan. The autumn's first Fieldfare, making its appearance a bit later than expected, was probably the most notable passerine. A Lesser Whitethroat, 2 Yellow-browed Warblers, 3 Chaffnches and a Brambling were also seen. Less windy, although not by much, the day's birding did reveal a few noteworthy species, although most passerines were presumably long-stayers. 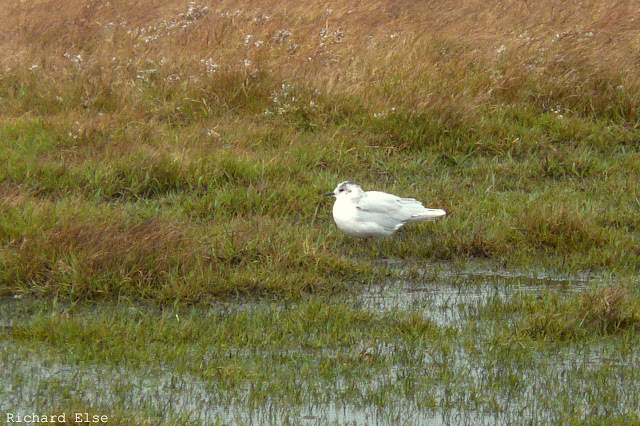 The best new birds were a juvenile Little Gull in Linklet Bay and a Short-eared Owl at the north of the island; the best of the non-movers were the Short-toed Lark, a Common Rosefinch, a Yellow-browed Warbler, 2 Curlew Sandpipers and the Greenland White-fronted Goose. 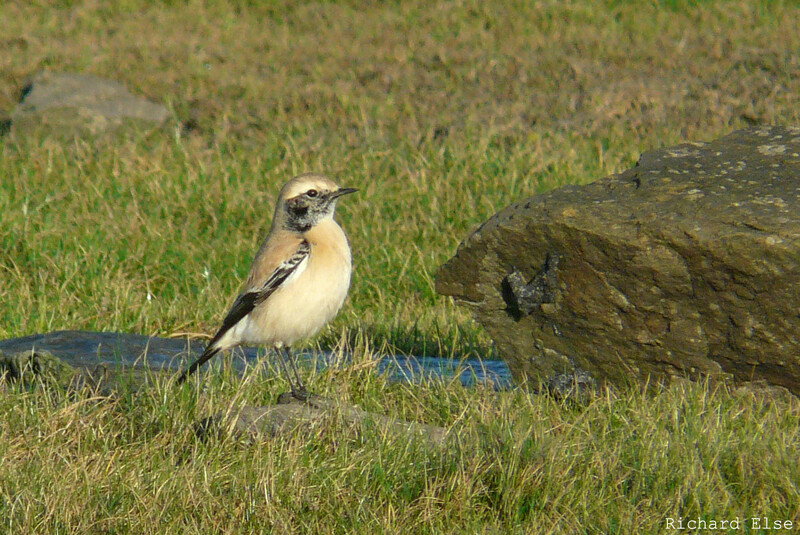 Other odds and ends included 3 Bramblings, 2 Chaffinches, 7 Blackcaps, a Whinchat, a Swallow, a Common Tern and 3 Arctic Terns.